Two lighthouses for the price of one! 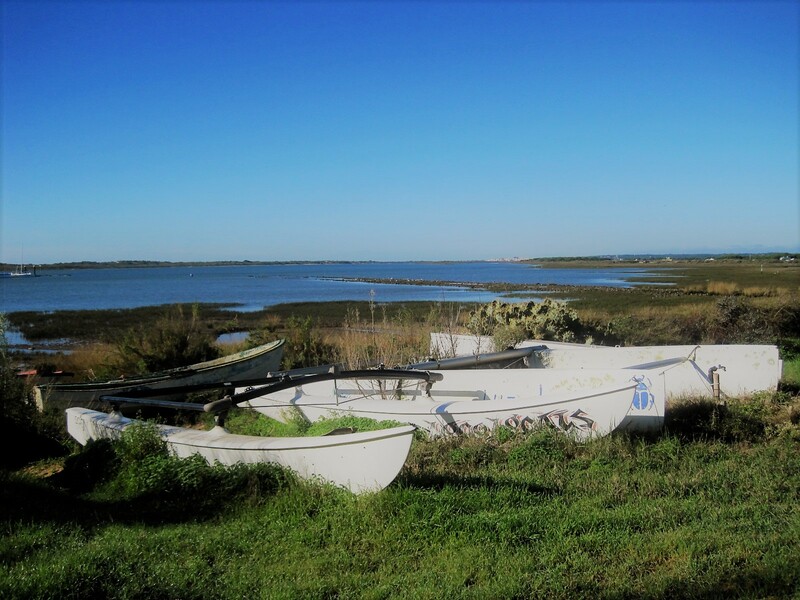 Driving into the village of El Rompido in Southern Spain, they are almost the first thing you see. The smaller of the two was erected in 1861, marking the mouth of the Piedras river. It no longer works, but its much taller amigo came along in 1975 and now lights up the estuary. Striking though they are, it’s not the lighthouses that have brought me here. 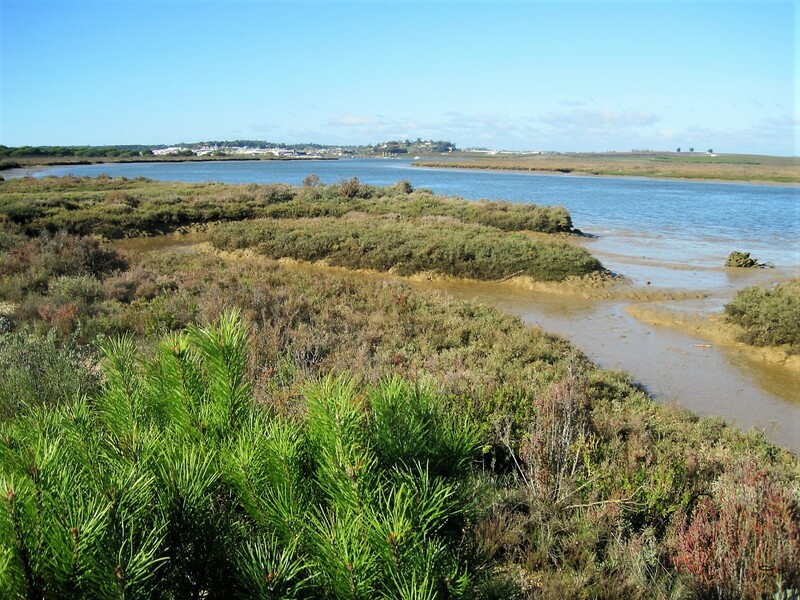 El Rompido is home to the Marismas de Piedra y Flecha nature reserve and there are beautiful walks around the salt marshes. 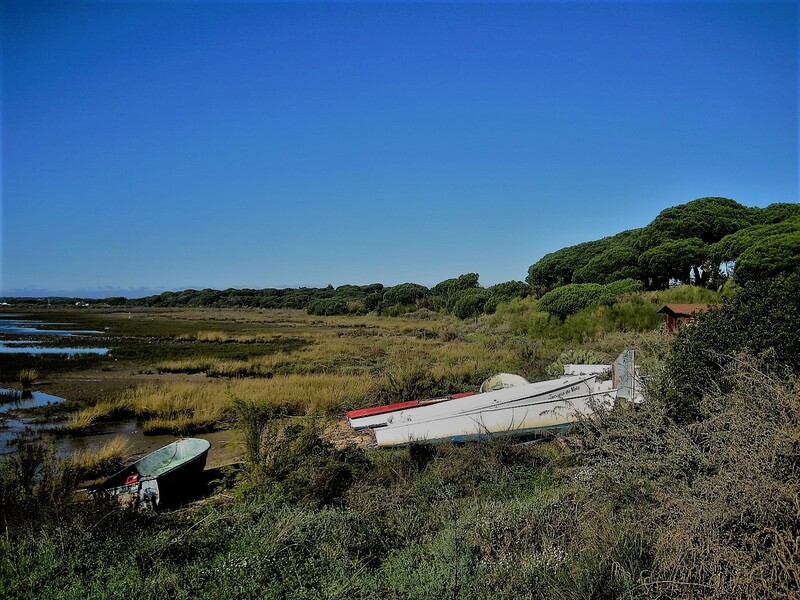 The trail leads out around the edge of El Rompido, once a quiet fishing village, and in the off season still retaining much of its charm. Bypass the small marina and the golf course and you are surrounded by nature in all its finery. The area is a magnet for bird watchers. The White Stork, Montagu’s harrier, stone curlew, the little grebe, the hoopoe, the spoonbill, the stilt, marsh harrier, the canastera, common tern, northern pintail, teals, the oystercatcher, the sandwich tern, the sandpiper, the plover, and the laughing gull can all be found here. As usual, my group was chattering like a flock of magpies so I failed to capture the evidence, but I did distance myself, once in a while, to admire the landscape. Information boards along the way give you clues as to what to look for, and in places the trail diverges so you have a choice- longer or shorter. If you’re with a group, pay attention, or you’ll find yourself taking a wrong turn. It hardly matters though, as the landscape is flat and you can see for miles. The humpbacked bridge is visible long before you get there. We have only crossed the border into Spain and driven half hour out to the coast, so it’s no surprise that the landscape is similar to that of the Algarve. Water rules here, too. A key difference arises as you turn into the woodland, where magnificent plumes of Umbrella pine line the path. 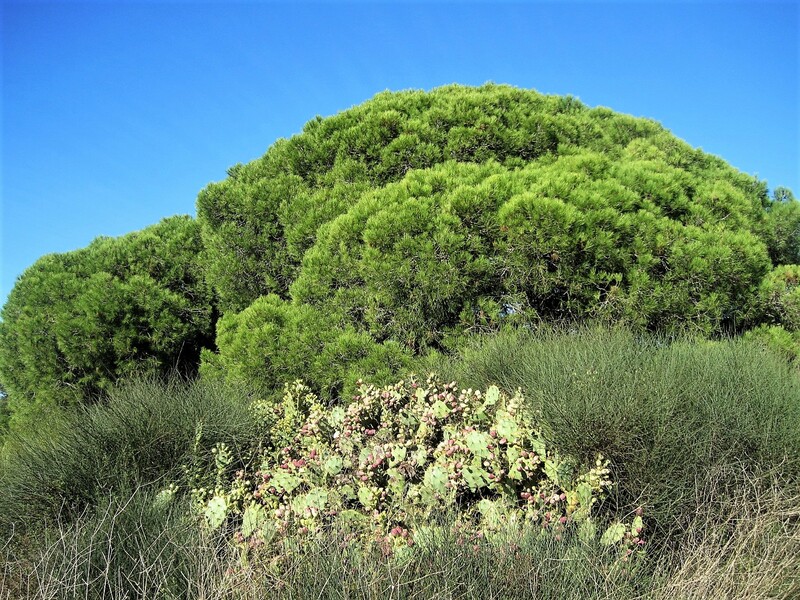 These are not so common in the Algarve, but we share the prickly pear. The trail turns back towards the village, and a boardwalk carries you past the golfers. It’s lined in places with the pretty lanterna that abound at this time of year, pink and yellow the most common. I especially like the rarer yellow and white variety. 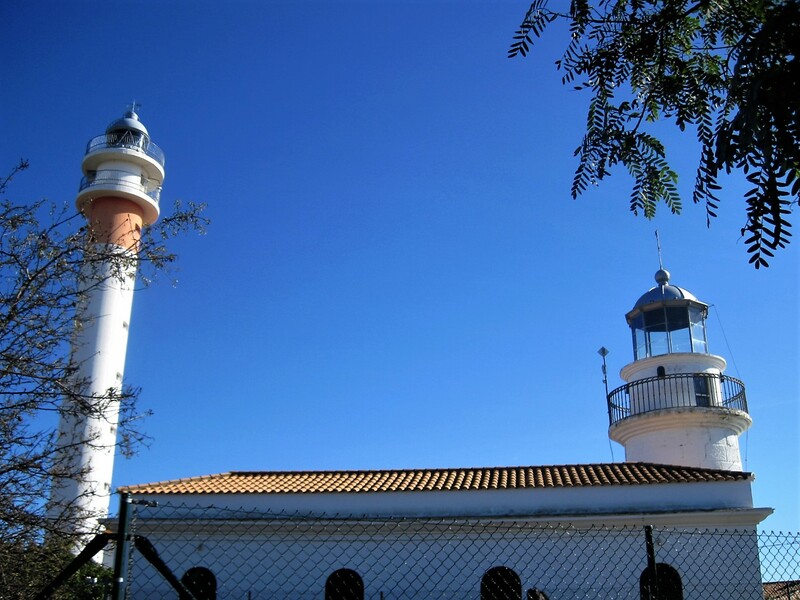 Before long you are passing the lighthouses again, with time to wander the back streets of El Rompido, nonchalantly examining shop windows for a trinket or two before they close for siesta. Or perhaps you are hungry and need to head straight to your restaurant. There are any number to choose from, some with rather nice sea views. Do stop in at the tourismo, beside the church, if you possibly can. The friendliest, most informative receptionist I have ever met! It’s worth a return trip just to talk to her, and maybe even try the ferry crossing. I like to end with a treat or two. The almond flavoured pudim flan was lovely, and isn’t that the most beautiful hibiscus you ever saw? And in case you are wondering what I’m doing in Spain, this is the other half of a pre-Christmas visit. I’m home in the Algarve right now, and it feels good. The midnight hour at New Year, as planned, was spent on Ponte Romano bridge in Tavira, in company with some lovely people. We were told the fireworks weren’t as good as last year, but it really didn’t matter. We were where we wanted to be. Thank you all for accompanying me on the journey. You’re welcome on Jo’s Monday walk at any time. Let’s share some walks, shall we? Susan pushed herself right to the edge on this one! The festivities in the Algarve are finally over and it’s onwards into another year. I have more to share than I can possibly make time for. Life is full here- new friends, new language. Be patient with me? I’ll do my best.